MKs quote the Torah directive to kill a pursuer after IDF commander is forced to shoot rock thrower dead. 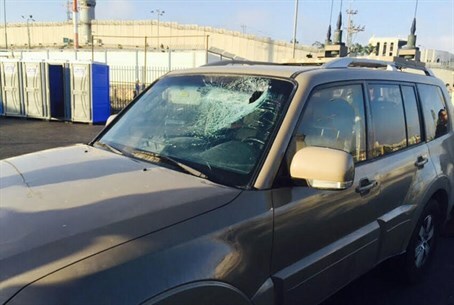 Nationalist politicians have risen to the defense of IDF Binyamin Brigade Commander Yisrael Shomer on Friday, after he was forced to shoot dead a Palestinian Arab terrorist hurling large rocks at the IDF vehicle he was in. "Whoever rises to kill you, kill him first," Education Minister Naftali Bennett (Jewish Home) stated on Facebook Friday. "I fully support the commander of the Binyamin Brigade who operated against terrorists to protect the lives of his soldiers and his own life." Science Minister Danny Danon (Likud) said, "I back Brigade Commander Col. Yisrael Shomer, who acted decisively and as needed when he defended himself and his soldiers from a terrorist who came to kill them. Against terror and violence we respond decisively." "Israel is pursuing a life for itself and its neighbors; human ethics and Jewish ethics require the fulfillment of the words of our sages: 'whoever wants to kill you, kill him first," MK Motti Yogev (Jewish Home) said in echo of Bennett's comments, as quoted by Maariv. "I strengthen the hands of the commander of the Binyamin Brigade, who found himself in danger and had to strike and kill his assailants." "This policy of uncompromising response to a terrorist event should get support from the security-political-legal system, and of course the backing of military commanders," he added. "This support must be given to all Jewish residents in Judea and Samaria during terrorist events." "Only a moral and just path will restore deterrence and strengthen our security in Judea-Samaria, Tel Aviv and Jerusalem." Deputy Defense Minister Eli Ben-Dahan (Jewish Home) added praise for Shomer as the commander of the very best of the IDF, and said he "has confidence" that he was operating according to IDF protocol. "Let it be clear: rocks are weapons in every respect, and it has been shown in the past that they kill," MK Nissan Slomiansky (Jewish Home) stated. "I am confident that the brigade did well and that all understand the message to rock throwers: stop throwing them." Describing the necessity to use lethal force, an IDF spokesperson told AFP that "the forces called the suspect to halt and shot warning shots in the air. Once he continued hurling rocks at close range and in response to the imminent danger the forces fired towards the suspect." This is the latest attack in a wave of terror which has gripped Israel since the beginning of Ramadan last month.